Meanwhile, Polk and Tamyao don’t like how rising property values and rents displace residents in a long dormant, mixed-use urban area being revitalized. Tamayo oversees the Soaring Over Meth and Suicide (SOMS) program that gives young people preventive tools to avoid abusing substances or doing self-harm. The mother of four brings “a lot of life experience” to the job. People close to her have committed suicide, battled drug addiction and suffered mental illness. She sees herself in the clients she serves. “We took them around to all the museums in D.C. The one they enjoyed the most was the Holocaust Museum. A lot of people wondered if that was going to be too traumatic for them. But when we talked to the kids afterward, they’re so used to seeing things on the reservation, they’re so knowledgeable historically of the things that have happened to Native Americans, that this didn’t affect them as it might a lot of others. 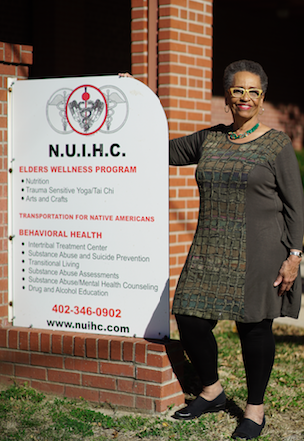 “Definitely, our focus is healthcare, but the connection between cultural activities and being able to identify who you are with how those things affect your health has come more about,” Tamayo said. “We’re able to do that to address the health issues we’re working with. “That’s very important because we look at that as a protective factor so kids can feel good about who they are,” said Polk.